5 Effective Ways to Help Children with ADHD Develop Math Skills | What is Psychology? Every child learns differently – some children are visual learners, some auditory, some tactile – but children with ADHD have difficulty focusing, sitting still, and are easily distracted, sometimes making it appear impossible to teach them anything. This impulsive, fidgeting behavior can make it seem as if youngsters with ADHD aren’t listening — which frustrates the teachers, parents and other adults in their lives who are trying to help them master the math concepts crucial to their continuing education. According to studies published in PubMed.gov people with ADHD have drastic and consistent differences in brain scans compared to those without ADHD, making it important to remember that ADHD has a physiological basis. This condition affects the frontal cortex part of the brain, which controls executive functions such as impulse control, memory and attention. Children with ADHD are often extremely intelligent, but because they lack the ability to focus or memorize at neurologically typical levels and don’t behave in an age-appropriate manner, they are sometimes dismissed intellectually. This is why untreated ADHD can lead to trouble in school and eventually, low self-esteem. One of the toughest aspects of continued mathematical learning is that it is cumulative, becoming more difficult as children progress in school. When the core concepts become longer, with more steps to remember, it is often challenging for a person with ADHD to maintain the necessary concentration to complete the assigned tasks. Fortunately, there are many ways to work with ADHD affected children so that they too can succeed. Below are 5 professional educator-recommended tips that have been shown to help kids with ADHD learn and retain mathematical knowledge. Children with ADHD often describe their need to “wiggle” as an uncontrollable urge akin to an inner itch that needs to be scratched. To deal with this excessive fidgeting, they are often given plastic, textured items to quietly play with in an attempt to channel their nervous energy into less distracting movement. But up-to-date teachers know that all kids – even those without ADHD – can benefit from the chance to work out excess energy at every available opportunity. Rather than giving kids small toys to play with in their laps or on their desks, embrace large scale activity. Work total body movement into the math lessons. Use the classroom space as a big board game, for example, and have kids move from desk to desk after solving equations. Let the kids get up and have a dance break or do jumping jacks between assignments. Kids with learning disabilities that affect memory can become stressed out by timed tests — further hindering recall, and creating negative results like low scores and anxiety. A simple and fair solution to this is to give kids with ADHD the same amount of time for tests and assignments as other kids, while still allowing them to get up and take breaks to work out excess energy and refocus. To allow for the best possible focus during math assignments, and especially during testing, place kids with ADHD in the quietest area of the classroom, and consider placement up front near the teacher to help them listen and learn. Some schools will even provide a portable cardboard “office” with a back and sides called a study carrel to sit on a desk for kids with ADHD (this can be written into an official 504 Plan, an IEP designed especially for kids with ADD/ADHD), blocking out all distractions for better student concentration. But 25% of all math errors can be traced to poor or unreadable handwriting, making it very important for kids with ADHD to practice writing neatly, despite how hard this might be for them to do. 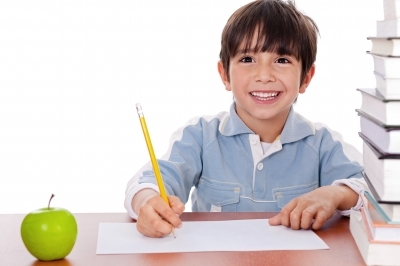 Kids can practice handwriting by tracing over numbers you have written lightly in pencil. Also consider using paper made specifically for handwriting practice, because this will give them dotted lines to use for extra guidance. Following multiple steps, and moving back and forth between tasks is extremely difficult for those with atypical neurology. Because their memories don’t retain information as long as typical brains do, having a separate answer sheet to show their work can seriously sabotage kids with ADHD. Also: If there are formulas involved, it is unrealistic to expect children with ADHD to memorize them all. Such a requirement even seems pointless when you consider then fact that in the “real world” application there is no reason a person in a math or statistics career field can’t simply look up any needed formulas. Recent EEG brainwave tests published in the journal Biological Psychiatry showed that the brain scans of teens with ADHD were consistently different enough that someday the analysis of brainwaves may help doctors diagnose and properly treat those with the condition. Brain scan differences prove that the brains of children with ADD/ADHD work differently than other kids. When teaching mathematics, or any other subject to children with ADHD, keep in mind that ADHD is a very real physiological issue. Kids with ADHD are not being defiant or not listening; they simply have a biological difference. While the disorder can be treated with behavioral therapy and medication, it is still extremely important to remain patient with them. If you find yourself becoming exasperated, take some deep breaths, and consider trying some of the helpful math skill-building tips for kids with ADHD listed above. Children with ADHD may have to try a little harder, or take a different path on the journey to mastering math concepts, but they can do it. Noelle Eberts has a passion for connecting children to the possibilities that math can unlock. She writes independently for www.mathnook.com/ and is a great resource for all kinds of kid’s math games. Noelle is a part-time math tutor and a full-time Mom!